Many people go through life feeling vaguely unwell, fatigued or with illnesses that seem to have no identifiable cause, and which conventional medicine cannot cure. Mystery illnesses such as Irritable Bowel Syndrome, Candida and food intolerances plague tens of thousands but can be cured by a simple change in diet. The Hay Diet, or food combining, is one of the most popular diets in the world and as an essential part of a healthier lifestyle can help anyone to eat their way to good health and vitality. A simple change of diet can have a dramatic impact on your all-round health and switching to the Hay Diet can cleanse and heal your body. The aim of the Hay Diet, uniquely among popular diets, is not an exclusive aim of weight loss but seeks to achieve optimum good health (and weight loss is only a part of that). 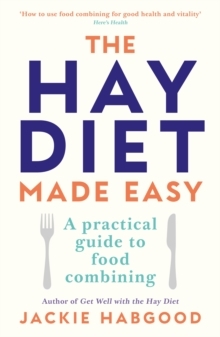 The Hay Diet is often perceived as complicated, with its range of rules about which foods can be eaten together but Jackie Habgood outlines how we can easily incorporate the Hay Diet into our daily lives. 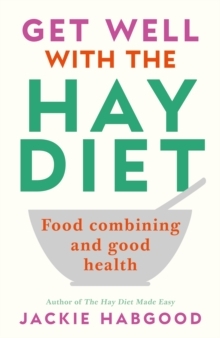 This is a practical, accessible guide to using the Hay Diet to find natural health, allowing your body to heal itself and reaping the psychological benefits of feeling good. Writing from her own experience, Jackie Habgood shows how the Hay diet can help people who feel constantly fatigued or vaguely unwell and do not understand why. Following the clear, practical format used in The Hay Diet Made Easy, she outlines problems that often go unrecognised and are notoriously difficult to treat by orthodox methods but which respond very well to the cleansing and healing effect of the Hay diet - hypoglycaemia, candida, allergy, M.E. With details of symptoms, advice on diet and nutrition the book shows how full health can be restored in a short time. It also provides plentiful resources and details of further reading. This book's sensible, easy-to-follow approach could make it a standard work.